Among the rarest of sculptures from the Southeast Moluccas are small masklike objects depicting the head of an animal. The dancer held the masklike object in his mouth by the tab extending from the back of the head. This type of object is thus sometimes referred to as a mouth mask. Only four mouth masks have survived, three of which are in European museum collections and represent pigs. 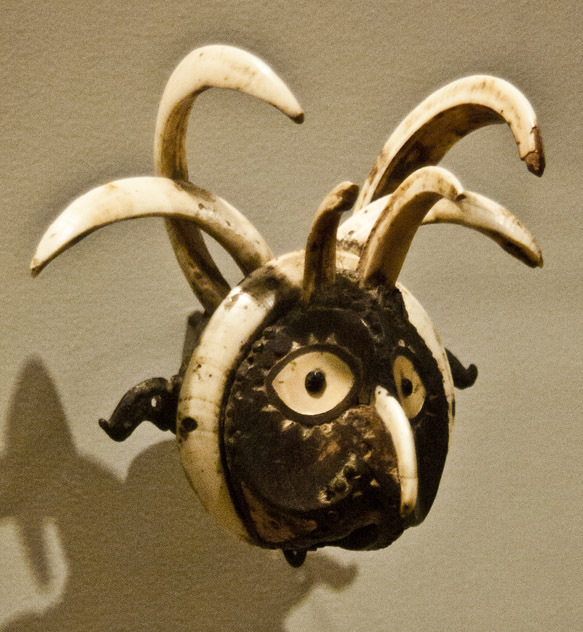 This Dallas mask depicts a bird, probably a rooster. The sculptor imaginatively used boar tusks to create the white feathers that rise above the head and encircle the bird’s face. Pig mouth masks are associated with a distinctive fertility ritual called porka, which encourages increase and abundance among human beings, animals, and vegetation. The bird mask shown here was used in a war dance that was performed by men and portrayed headhunting.